Soon the steel workers, many of whom had been sceptical at the outset, were getting an extra hour of sleep on work nights. 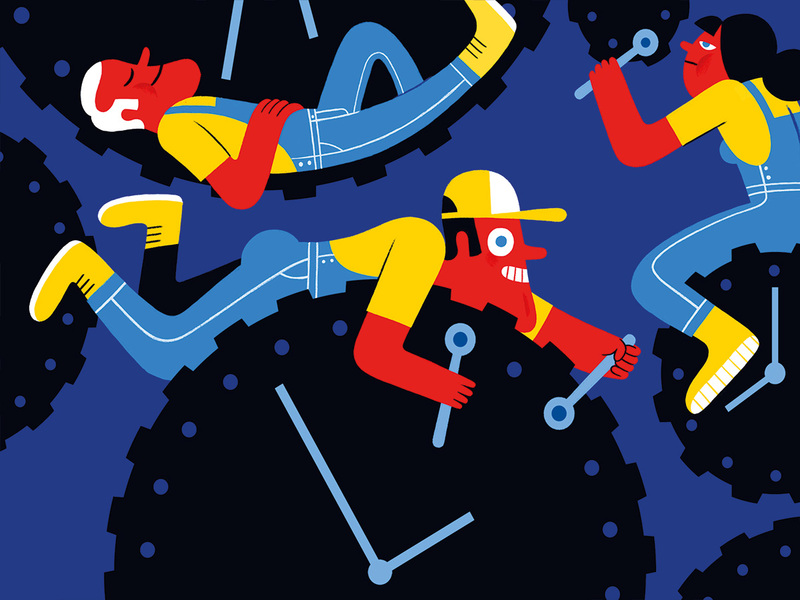 By simply aligning work schedules with people’s internal clocks, the researchers had helped people get more and better rest. In recent years, US educators have been paying increased attention to their students’ sleep needs, with growing debate about delaying school start times. Now a number of businesses are following suit, encouraging their employees to work when their bodies are most awake. “It’s a huge financial burden not to sleep properly,” Roenneberg said. “The estimates go towards one per cent of gross national product,” both in the United States and Germany. Emerging science reveals that each of us has an optimal time to fall asleep and wake up, a personalised biological rhythm known as a “chronotype.” When you don’t sleep at the time your body wants to sleep — your biological night — you don’t sleep as well or as long, setting the stage not only for fatigue, poor work performance and errors but also health problems ranging from heart disease and obesity to anxiety and depression. Studies on workers in the call centre of a mobile phone company, a packaging manufacturer and an oil transportation company show that these employees are more stressed and may experience more work-related discomfort and pain. It’s the mismatch — not the hours themselves — that matters. A 2015 Harvard Medical School study found that for night owls, working during the day increases diabetes risk. Among the companies seeking to remedy the problem is Southwest Airlines, which allows pilots to choose between morning and evening flight schedules. The US Navy recently traded an 18-hour submarine shift schedule for a 24-hour one that more closely matches sailors’ biological rhythms. And at some pharmaceutical, software and financial companies, managers expect employees to come to the office for only a few hours in the middle of the day — or to work off-site entirely. Worker fatigue has played a role in many workplace accidents, most famously the Challenger space shuttle explosion and the Exxon Valdez oil spill, but no doubt countless more on the commute to and from work. The National Highway Traffic Safety Administration estimates that drowsy drivers cause 16.5 per cent of fatal crashes. Sleep deprivation may even lead to ethical breaches at work. In a 2014 experiment, Christopher Barnes of the University of Washington and colleagues asked 142 people with extreme chronotypes to show up at their laboratory either at 7am or at midnight for a dice-rolling game that offered a $500 prize. Reporting was on the honour system. Morning people lied 18 per cent more when they did the task at midnight than when they did it in the morning, whereas night owls lied 16 per cent more when doing the task at 7am. Roenneberg has collected data from 300,000 people and found that chronotypes plot as a bell-shaped curve, with a few individuals at each extreme and most falling somewhere in the middle. According to Roenneberg’s research, the most frequent chronotype — held by about 13 per cent of the population — sleeps from around midnight to 8am. Thirty-one per cent of people have an earlier natural bedtime, and 56 per cent have a later one. That means for at least 69 per cent of the population, getting to the office by 8 or 9am requires waking up before their body is ready. To determine your chronotype, imagine that you have two weeks of vacation to spend as you like, with no evening or morning commitments and no pets or children to wake you. Chronotypes reflect habits as well as biology, so you would also need to eliminate caffeine and avoid artificial light at night, which pushes a person’s chronotype later. At what time would you tend to fall asleep and wake up? Don’t be surprised if you’re unsure. After years spent accommodating work, family and social commitments at the expense of sleep, “a lot of people don’t know what rhythm they have,” Kring said. Chronotypes shift in a predictable way over the course of a lifetime. Between the ages of 12 and 21, everyone’s natural sleep schedule gets about 2 1/2 hours later — which is why adolescents have so much trouble waking up for school. After that, chronotype creeps in the other direction, which is why older people typically find themselves waking earlier than they used to. But chronotype determines more than when you sleep and wake. It orchestrates predictable peaks and troughs of energy over the course of the 24-hour day. The “window of circadian low,” the hours when the body is least adapted for wakefulness, typically occurs between 2am and 6am. There’s another, smaller dip 12 hours later, in the midafternoon. At the Denmark offices of pharmaceutical company AbbVie, employees design work schedules that take advantage of their biological strengths. A nine-hour training programme helps them identify when they are ripe for creative or challenging projects, typically mornings for early risers and afternoons for late risers. Lower-energy periods are meant for more mundane tasks, like handling emails or doing administrative chores. Workers save commuting time by avoiding rush hour traffic, and can better mesh their personal and professional lives — for example, by getting their children from school in the afternoon, then working from home at night after the children are in bed. According to company surveys, employee satisfaction with work-life balance has risen to nearly 100 per cent today, from 39 per cent 10 years ago, when the programme started. In 2017, the Denmark division of Great Place to Work, a global organisation that ranks companies based on employee satisfaction, named AbbVie the top middle-size company in the country. “The flexibility actually empowers people to deliver the best possible results,” said Christina Jeppesen, the company’s general manager. A 2018 survey by the Society for Human Resource Management, which represents 300,000 HR professionals in more than 165 countries, found that 57 per cent of its members offer flexible hours, 5 per cent more than in 2014. “Managers who give it a try often find that employees’ morale, engagement and productivity all go up, because they are working at a time that works best for them, and able to get the most work done,” said Lisa Horn, the group’s vice president for congressional affairs. Some companies restrict meetings to “core hours”, between, say, 10am and 3pm, to accommodate various schedules. Others build flextime into the workweek. At Phase 2, a software development firm in Oklahoma City, each week ends with “productivity Friday,” when employees are expected to work remotely in a place of their choice, whether that be from home, a coffee shop or at a weekend house at the lake. Stefan Volk, a senior lecturer at the University of Sydney Business School, has suggested that businesses can leverage chronotypes to maximise team success. For example, members of a surgery team should have similar chronotypes because they need to be in top form simultaneously. But at a nuclear power plant, workers should have different energy peaks, so that someone is always on the alert. But while lots of corporations promise flexibility, veering from the traditional 9 to 5 work hours requires a cultural shift. A 2014 study led by Barnes found that many managers have an ingrained prejudice in favour of early birds, whom they perceived as more conscientious simply because they arrived at work early, a view that could dissuade some workers from using flextime.